The Sherman Symphony Orchestra has about 45-50 volunteer musicians (several Austin College music students among them) and adds as many as 25 professionals for certain concerts. The orchestra is an important part of the Community Series, and it takes the stage for four or five presentations annually. Since 1992, Maestro Daniel Dominick has conducted the symphony. Since symphonies are complex organisms, smaller orchestras often keep to the basics—violins, cellos, brass, flutes, oboes, percussion, piano, and clarinets. Not so with the Sherman Symphony. They go a step beyond, with bassoons, piccolos, timpani, and a harp. Positions open up from time to time, and if you are interested in an audition, contact Maestro Dominick. Of course, if you’re an English horn player, no waiting is required. There’s a spot open right now. A typical audience in Kidd-Key Auditorium numbers about 500. That number grows to over 800 for the Christmas Pops, a concert so popular that the orchestra offers two performances to accommodate everyone for whom it is annual holiday treat. The concerts are a bargain, and students get in free. A season ticket for the Community Series, usually nine, 10 or 11 events, including the Christmas Pops, is $60. Five years ago, Maestro Dominic introduced the symphony’s first Children’s Educational Concert for Grayson County ISD fifth-graders. Like the Pops, it is now an annual event, where more than 1,200 students and teachers are entertained with highlights from different musical works, descriptions of the meaning of the selections, and instrument demonstrations. Before the event comes to an end, conductor Dominick invites two children from the audience to take the baton and lead the orchestra. The symphony also supports the Sherman High School choir, inviting them to perform with them on occasion. Contributions from music lovers in Grayson County provide most of the symphony’s operating budget, although several area foundations contribute, and the Sherman Council for Arts and Humanities (SCAH) chips in, as well. The City of Sherman aids in scheduling the use of Kidd Key and provides for the storage of instruments and equipment. Austin College provides the Sid Richardson Auditorium for the Christmas Pops concerts each year. The symphony presents a concerto soloist at least once a year. They look for an up-and-comer, someone who is making a name, but is not yet so expensive as to strain the budget. Many of these musicians perform regularly in cities such as New York and Boston, and some have considerable exposure in Europe. Soprano Emily Newton, a Texas native from Lake Jackson, who is winning critics in the New York area, was such a hit two years ago that she will be back by popular demand for the April 2007 show. Sherman is fortunate to have a talented and dedicated group of musicians to provide a classical musical experience that is rare indeed in a community this size. The quality of the music is borne out by the pride expressed by all the players—they all feel fortunate to be a part of something unique and so special. 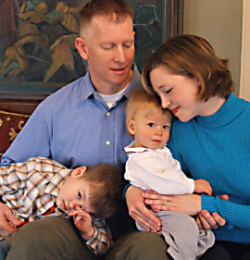 Daniel and Laura Dominick with Grant and Jackson. Education: Florida Southern College, Lakeland- Bachelors of Music in Piano Performance; Florida State University, Tallahassee; Masters in Orchestral Conducting; Masters in Historical Musicology (double Masters took 6 years to complete concurrently). Instruments: piano, trombone, viola. When he arrived at Florida State, Dan Dominick unpacked his trunk and immediately set out to meet as many fellow music students as he could. One can’t be a conductor without musicians to conduct, and when you need 40 or more classically trained players to support your career plans, you can’t afford to waste time. Dominick found his orchestra and earned his baton, and when he graduated in 1991, he came to Sherman to interview for a job in the music department of Austin College. He met with the college president, and auditioned for Maestro Cecil Isaac. Winter in North Texas, cold and drab, was a long way from the sunny clime of western Florida, but opportunity is often disguised. They offered; he accepted. Dominick has been at Austin College since. He teaches music history, music appreciation, and piano. He took the baton of the symphony in 1992 when Maestro Isaac retired, and Dominick still plays the piano and, on occasion, conducts orchestras in Europe. Classical music, classic cars, and classic houses are the things that move Dan Dominick. The public sees the first when he is on the podium with the symphony, but unless they dig a little deeper, they won’t know about the other two. Dominick’s brought a ’67 Mustang, a ’68 Firebird and several MGs back to life. And lately he has traded the mechanic’s tools for a carpenter’s apron as he and his wife, Laura, hammer and saw and scrape and paint and paint and paint and paint — he says the painting never seems to end — on the old house they are restoring. At 4 and 1, sons Grant and Jackson aren’t much help yet, but their time will come. With Clare Cason, music is a family affair. Her parents were musicologists at the University of North Texas. She has seven brothers and sisters, five of whom are string players. Sometimes talent just runs in the family. Clare began violin at age four, studying with UNT professor James Lerch. In three years at Denton High School she won a spot on the all-state orchestra three times. It doubtless would have been four times except that she finished high school in three years and was an early-entry student at UNT on a National Merit Scholarship. Her father was director of the Early Music (sometimes referred to as “period” or baroque music) program, and she was playing in his group at the school even before she entered college. She had an orchestra scholarship at UNT, and as a senior she was the Presser Scholar, an honor awarded for excellence in both academics and music. Clare Cason is the concertmaster, or more properly in her case, the concertmistress, of the Sherman Symphony. 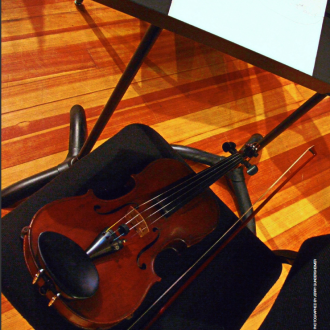 It is the official title of the principal first violinist, and with the title comes responsibilities. The first violins play the higher of the two violin lines and Clare must make sure that the bowings, the exact back and forth movements of bows upon strings, are synchronized as much as possible. “I’m not a fanatic for the appearance, but if everyone is doing different things, it makes a difference in the quality of the sound,” she explains. She is in charge of the string section as a whole, answering any questions that may arise about the music. The conductor is consulted by her regarding any issues the string section has, as well. Lastly, she coordinates the tune-ups of the orchestra, this likely being a function handed down from the baroque period when groups were too small to warrant a full-fledged conductor. 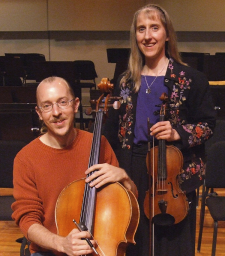 Did we say “family affair?” Clare’s husband, David Cason, is the orchestra’s principal cellist. He grew up in Farmer’s Branch, and after starting on the piano in the first grade, he became a cellist in the middle school orchestra. He wanted to play the big bass, but the instrument towered over him, so the director decided the cello was his calling. He moved on to W.T. White High School where he earned honors on the All-State Philharmonic Orchestra. Clare and David met while attending the same music history class at UNT. In college David studied with a specialist in chamber music, and that style became and remained his particular passion, today he devotes considerable time to typesetting, modernizing, and publishing rare chamber music scores from the late 19th and 20th centuries. Dan Dominick recruited the talented pair to fill two principal vacancies in the orchestra in 1996. They are in their 11th season as principal musicians and appreciate the opportunities to continue performing. “Community orchestras serve a valuable purpose in providing an opportunity for those who might have other jobs, or who wouldn’t have a chance to play beyond high school, to play in a group setting,” Clare said, and David agrees. Where else could a man and wife make such beautiful music together? She knew what she wanted, for she quickly made All State in flute. In fact, she was All State three out of her four years in high school and also made it to the All State Symphony Orchestra. In college at Texas Tech, she majored in piano performance but played the flute in the university symphony and in the Lubbock Symphony. She also taught both flute and piano. Barker moved to Sherman in 1984, where she met her husband Larry, a physician. She saw a notice for symphony auditions and auditioned. There were no flute positions open that year, but, as a back up, she filled in for absent musicians at every concert. The next year, when the principal flute player moved away, Barker became an orchestra regular. She has since played both first and second chair. What’s the hardest thing about flute playing? “Intonation, being in tune,” she said. “It involves how to hold the jaw and keep it from shaking.” And her advice to prospective flute players: “Find a good teacher!” As far as she is concerned, in Sherman one need look no farther than the chair next to her in the orchestra. That’s Megan Pettitt, and Barker says she’s one of the best teachers around. His mother said he’d have to play piano for four years before she’d allow him to try another band instrument. He complied, and at 10, Paul Dods had a tough choice—a flute or a clarinet. All the flute players in the band were girls, so the choice wasn’t so difficult after all. Playing for the State Champion marching band at his high school in Kansas City, he played the B-flat clarinet, but also learned the more unusual A clarinet. Along the way, he picked up the alto and baritone saxophones. His talent and versatility brought a scholarship in band at Texas Christian University, where he played with the campus symphonic orchestra, the jazz band, and the musical theater and for university operas and taught on the side. Musically inclined or not, Dods majored in computer science, put the reeds aside on graduation and worked for 17 years as a data systems programmer in Dallas. Five years ago, retired from the computer industry, Dods started playing again. He joined the Plano Community Band, where he met a band director from McKinney and was drafted to teach clarinet to middle school children in McKinney. He has since opened a private studio, and he now teaches some 50 clarinet players. When Dods found out about an opening with the Sherman Symphony, he arranged an audition and won a seat. In short order, helped out by a strategic retirement or two, Dods was 1st clarinet and then, a year ago, he became principal clarinet. 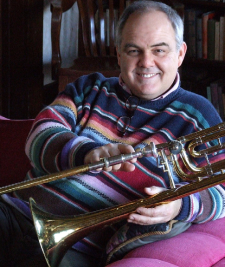 Hunt Tooley picked up a baritone, or euphonium, in the fifth grade band but soon switched to the trombone. After high school and a basket of awards and honors, the horn player considered a career in music, but he wanted to go to Texas A&M and then there was no music curriculum. Aggieland does have a band however, one of the biggest ones around, and so Tooley studied history and marched to the “Chigger-rigger-rem” of the Aggie Fight Song. He was teaching history at Erskine College in South Carolina when he met a fellow faculty member named Felix Bauer who inspired him to put more study into his music. He continued that study when he moved to Sherman to join the Austin College History Department. He joined the symphony 16 years ago, but he will be quick to acknowledge that his musical education, both as a player and as composer, will never end. He has been playing the trombone for nearly 40 years, but he still feels there’s room for improvement in his playing technique, and recently he embarked on a personal quest to eliminate some ‘bad habits’ to his sound. Tooley and his wife Karen have a new pastime—English country dancing. It is the kind of ballroom dancing seen in recent movies such as Pride and Prejudice and Sense and Sensibility, complete with period dress. When he was in third grade, his mother, a violinist, got Mike Walker to start piano lessons. In the fifth grade, he took up the trumpet, and he has played it ever since, first with the marching and concert bands when he was a Yellow Jacket at Denison High School and at University of North Texas. He also taught trumpet theory while still in school, and as a senior, he played for the North Texas Choir. That connection produced a three month European tour with stops in Spain, Finland, Iceland, Denmark, and Luxembourg. Walker taught in Killeen and Arlington, before coming home in 1979. A friend suggested that he try out for the symphony, where he has played for more than 25 years. Among his favorite pieces to play is Bugler’s Holiday, which features three trumpet parts. He likes the challenging rapid notes which require a technique called ‘double-tonguing’, in which the notes are made possible only by alternately articulating “t” and “k” sounds. The piece is already on the program for next year’s Pops concert. Is there a flute chair open? If so when are tryouts. Think of a pinball machine, the kind with the little steel sphere that rockets off the end of the plunger, a bundle of kinetic energy that bounces and careens and ricochets off the bumpers and over the triggers, making lights flash and bells ring and things go whirr until it runs out of momentum and slips through the return slot.